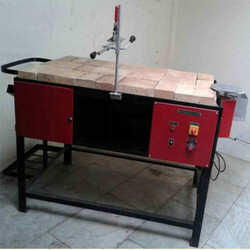 Providing you the best range of arc welding table with positoner and gas welding table with effective & timely delivery. Welding Table should be with 16 mm holes in GRID pattern, suitable for dimensional Fixture for holding jobs. Welding Table should bel made up of high quality Material and with Precise finish on the TOP. Suitable for holding and Positioning Diffrent types of welding jobs, using wide range of clamping accessories. It must be highly accurate system to HOLD the JOB and Fix its position for welding. After welding. the JOB should be removed easily and fast in order to replace the new job. welding Table with holding Accessories is used for faster in order to replace the new job. Welding Table with holding Accessories is used for faster, easier, efficient, accurate production line. Accessoies are quickly changeable so it reduces the SET up time of the JOB for welding. Tool box with door to keep all the items of this Table to be Provided below the table top. Welding Table is provided with suitable GTAW, GMAW welding gun holder. Welding table is with suitable KIT of JIGs / Fixtures/ clamps for clamping the job as required for welding. All JIGs/ Fixtures/Clamps can be inserted into any hole on the table for quick and accurate holding and mounting the job on the table. Table mount C-Clamps Insert into any hole on the tabletop for quick pushdown clamping holding and mounting the job on the table. Insert type clamps Insert into any hole on the table top for fast and easy clamping and holding the job on the table. Stop and Clamping Squares This is to support the job vertically, can be used to elevate job. Specially used for various fit up applications in welding sheet metal box, Vertically mounted pipes / plates welding. D-Stop Bars It fixes the job location and position effeciently and then with the use of different clamps the job is fixed /removed form the table This are used with threaded adeptors. Magnetic rests It is to be place anywhere on the table to hold, elevate and level the job. Welding Table has arrangement for mounting Positioner on one side of table with Turn Table with slots to keep JIGs for clamping the Job as required for Welding. 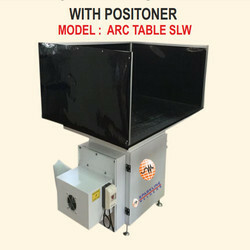 Positioner is Motorized with Speed Controller and is operated by Foot Switch. Clamp is with Vertical and Horizontal pipe fixed with coupling to adjust Height and Length both with Horizontal pipe has One clamp to hold the Job. The Welding Table has partition to keep all jobs and other items in the Table. Looking for Welding Tables ?